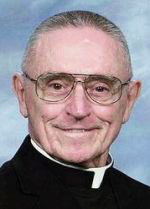 Father Howard K. Krick, 85, a retired priest of the Philadelphia Archdiocese and a former United States Air Force chaplain who rose to the rank of lieutenant colonel, died March 25. Born July 28, 1929 in Central Falls, R.I., the son of the late Thomas S. and the late Emma M. (Brophy) Krick, he attended Lawton School, Northeast High School and graduated from Roman Catholic High School, all in Philadelphia, before entering St. Charles Borromeo Seminary. Graduating from the seminary at the top of his class, he was ordained May 15, 1958 by Archbishop John F. O’Hara at the Cathedral of SS. Peter and Paul and his first assignment was as parochial vicar at All Saints Chapel at the former Philadelphia General Hospital. He also served St. Laurence Parish, Upper Darby; St. Maria Goretti, Hatfield and Resurrection of Our Lord, Philadelphia. He entered the chaplain service with the Air Force in 1966 and over his career had tours of duty at airbases in Alaska, New York, South Dakota and Texas, as well as the Philippines, Japan and Panama. During his tours in Japan Father Krick climbed Mount Fuji several times and once packed his full Mass kit to celebrate the eucharistic liturgy at the summit. After his retirement from active duty he stayed on in San Antonio, Texas, assisting part-time as a contract chaplain at Lackland Air Force Base and also doing local pastoral work, giving youth retreats and assisting at parishes. He returned to the Philadelphia Archdiocese in 2003, living in retirement until recently at Regina Coeli Residence for Priests, Warminster, and in his final years St. Joseph’s Villa in Darby. He also kept himself very fit for his age, exercising and lifting weights, Msgr. Beisel recalls. At St. Robert Bellarmine, where Msgr. Beisel is now pastor, he would come to help when asked. Father Krick might well have stayed in retirement in San Antonio if it were not for the illness of a sister in this area, according to Father Richard Rudy. The two met at an archdiocesan priests’ convocation in 2003 shortly after Father Krick’s return to the archdiocese and they became instant friends despite a two-decade age difference. “He used to tell me about all of the men and women he encountered in the service who needed help, that he assisted in his roles as a chaplain and a lieutenant colonel,” Father Rudy said. “He had a great wit and a charming smile; he was open, compassionate, a good listener and when he spoke he had something to say. A service for the Reception of the Body followed by a viewing will take place at 9 a.m. Wednesday, April 1, at St. Francis Center for Rehabilitation and Healthcare, Darby. The 10:30 a.m. funeral Mass will be celebrated by Archbishop Charles Chaput as principal celebrant. Concelebrants will include Msgrs. James Mortimer and Daniel Sullivan plus Father Rudy and Msgr. Beisel, who will be the homilist. Father Krick is survived by 13 nieces and nephews, their spouses and children. Interment will be at Holy Sepulchre Cemetery, Cheltenham. Thank you for your service, Father.